TORONTO, January 30, 2019 – Welcome to the fourth edition of the weekly Woodbine Snowbirds Report, now in its eighth year, chronicling the winter adventures of Woodbine-based trainers and jockeys currently plying their trade south of the border. 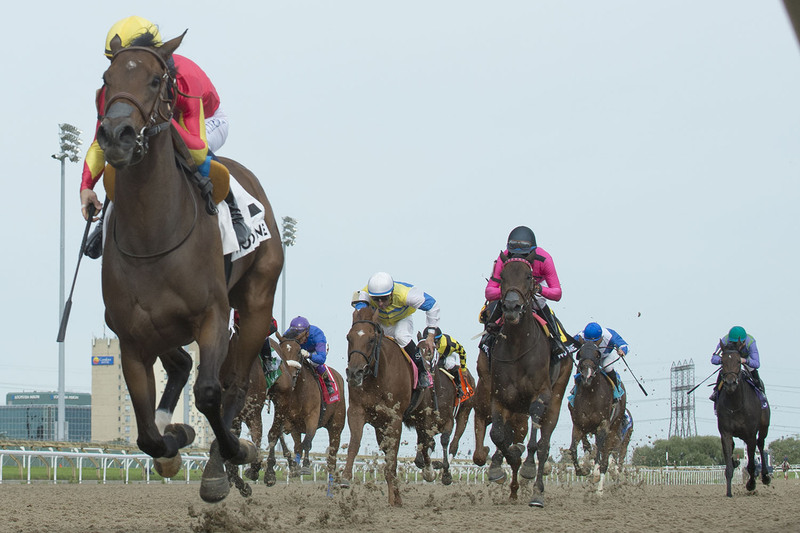 It was a successful week for the Woodbine trainers and jockeys, as seven Woodbine trainers made trips to the winner’s circle last week, highlighted my Michael Maker, who won eight races, including three stakes. Maker’s stakes winners last week included Zulu Alpha in the Grade 3 W. L. McKnight Stakes at Gulfstream Park on January 26, Bigger Picture in the Grade 3 John B. Connally Turf Cup Stakes and Susie Bee in the Jersey Lilly Stakes at Sam Houston Park on January 27. Maker’s other winners during the week included Booby Trap (January 23, Gulfstream Park), Fast and Accurate (January 26, Fair Grounds), Heavenly Hill (January 26, Turfway Park), California Night (January 27, Aqueduct), and It’s a New Year (January 27, Gulfstream Park). In all, Maker recorded eight wins, four runner-up finishes and three third-place finishes from 30 starters last week. Trainer Mark Casse was back in the winner’s circle last week with Olympic Runner, who won the opener at Gulfstream Park on January 26. Casse also saddled Shamrock Rose for the first time since her win the Grade 1 Breeders’ Cup Filly & Mare Sprint at Churchill Downs in November. Fresh off of her Eclipse Award victory on Thursday night as Champion Female Sprinter, Shamrock Rose finished fourth in the Grade 3 Hurricane Bertie Stakes at Gulfstream Park on January 26. Norm McKnight started the Oaklawn Park meeting successfully with three winners during opening weekend. McKnight recorded wins with Golden Bullet on January 25, Cool Catomine on January 26 and Redeal on January 27. In all, McKnight recorded three wins, a runner-up finish and two third-place finishes from 10 starters last week. Steve Chircop picked up his first win of 2019 with I’ll Take the Cake at Penn National on January 25. Chircop also recorded four runner-up finishes last week from Lovin Spoon Phil (January 25, Penn National), Meet You At Home (January 25, Penn National), Flashinthepants (January 26, Penn National) and Studio B (January 27, Laurel Park). Justin Nixon recorded a win and third-place finish at Laurel Park last week, as Street Review was third on January 25 and Field Letters won her career debut on January 26. John Simms recorded a win at Tampa Bay Downs last week with Wall Street Wolf on January 27. Simms also sent out La Dolce Uno to a fourth-place finish at Tampa Bay Downs on January 26. Three Woodbine jockeys made trips to the winner’s circle last week, including Luis Contreras, who won five of his 19 starts at Sunland Park, highlighted by Nitrous in the Riley Allison Derby on January 27. Other Contreras winners from the week included Victim of Love (January 22), Get Er Done (January 22), Devil’s Tech (January 26) and Hollywood Henry (January 27). In all, Contreras recorded five wins, three runner-up finishes and four third-place finishes from his 19 starts last week. Ademar Santos won three races at Tampa Bay Downs last week, including La Sirentia on January 25, Whiskey Train on January 26 and Chase Your Dreams on January 27. In all, Santos recorded three wins, three runner-up finishes and three third-place finishes from 14 starts last week. Chantal Sutherland recorded a pair of wins at Fair Grounds, including Singinginthewind on January 24 and She’sonthewarpath on January 25. In all, Sutherland recorded two wins and a third-place finish from 16 starts last week. Rafael Hernandez recorded a pair of runner-up finishes and a third-place finish in 11 starts at Aqueduct last week. Kirk Johnson recorded a pair of runner-up finishes from four starters at Mahoning Valley last week, as Freudian Fall and Hidatsa Park both finished second on January 26. Johnson’s other mounts included First Victory (4th, January 22) and Hansanity (7th, January 26). Isabelle Wenc recorded a runner-up finish aboard Sunset Gables in two starts at Mahoning Valley last week. Wenc also finished seventh with Wemadeittofifty on January 26. Jerome Lermyte had a pair of mounts at Fair Grounds last week, including Seeking a Star (9th, January 25) and Field Patrol (7th, January 26). Here’s a look at how the other Woodbine trainers fared last week, in alphabetical order, starting with Kevin Attard, who sent out four runners at Gulfstream Park, including Melmich, who finished third on January 25. Other Attard runners last week included A. A. Azula’s Arch, who finished fourth in the Grade 3 La Prevoyante Stakes on January 26, Bossy Madam (10th, January 21), and Cause for Alarm (7th, January 26). Sid Attard sent out a pair of runners at Gulfstream Park last week, included Gilded Warrior, who finished third on January 24. Donnie Brasco finished sixth on January 25. Roger Attfield saddled a pair of horses in Saturday stakes at Gulfstream, including Corps de Ballet, who was 10th in the South Beach Stakes, and Ickymasho, who was 7th in the Grade 3 La Prevoyante Stakes. Last Sunrise finished sixth at Gulfstream Park on January 26 for Catherine Day Phillips. Michael De Paulo sent out three runners at Gulfstream Park last week, including Bears Mafia, who finished third on January 23. De Paulo also sent out Johnny Bear, who finished 13th in the Grade 3 W. L. McKnight Stakes on January 26, and Marwoods War, who finished fifth on January 27. Littleroughjustice finished fifth at Gulfstream Park on January 23 for Nicholas Gonzalez. Run for Peace finished 10th at Gulfstream Park on January 21 for Michael McDonald. Barb Minshall sent out Gorgeous Kitten to a seventh-place finish at Tampa Bay Downs on January 26. Steve Owens recorded an in-the-money finish at Gulfstream Park last week with Emperor John, who finished third on January 27. Owens also sent out Eminent Force to a seventh-place finish on January 25. Station Rock finished sixth at Gulfstream Park on January 23 for Pat Parente. Gerald Seymour saddled Glencairn to a fourth-place finish at Aqueduct on January 27. Stuart Simon recorded a runner-up finish with Sister Peacock at Gulfstream Park on January 25. William Tharrenos sent out a pair of runners at Gulfstream Park last week, including Specialcnsydration (8th, January 21) and In Gus We Trust (5th, January 21). Stroll to the Beat finished ninth at Gulfstream Park on January 24 for Daniel Vella. This entry was posted in Woodbine News and tagged Ademar Santos, Eclipse Awards, Luis Contreras, Mark Casse, Michael Maker, Norm McKnight, Shamrock Rose, Snowbirds Report, Steven Chircop, Woodbine. Bookmark the permalink.